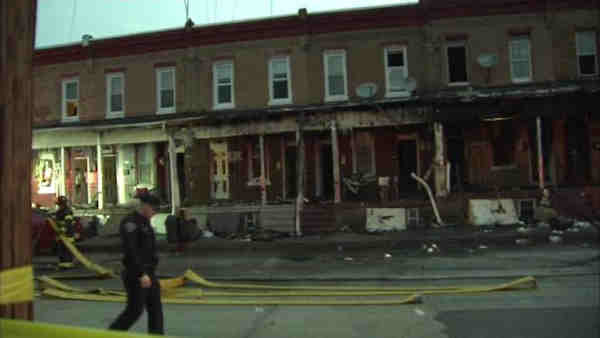 CAMDEN, New Jersey -- Six people, including four children were injured in a fast-moving house fire in Camden. The fire started after 4:30 a.m. Friday on the 800 block of Haddon Avenue. Flames quickly spread to neighboring homes. At least eight homes that housed apartments were damaged. An Action News viewer captured the flames on video. Action News viewer captures the flames from Camden house blaze. Firefighters were able to place the blaze under control within a half hour. The fire was located on the first and second floors. Two people had to jump from a window to safety. One resident Michaela Taylor said her boyfriend woke her up, and saved her. The victims were taken to Cooper and Our Lady of Lourdes hospitals for treatment. Most of the injured suffered from smoke inhalation. They are expected to be okay. The fire marshal is trying to determine the cause of the blaze. They have not said if the fire is suspicious.